Today we’d like to introduce you to Debbie Mercer. Debbie, can you briefly walk us through your story – how you started and how you got to where you are today. I always wanted to be a runner. I used to watch people run around Memorial Park and I would think, “I wish I could make it around that three mile loop”. Then one of my friends told me about Houston Fit. I knew it was a marathon training program but I thought I would just build my endurance to three miles and then stop. 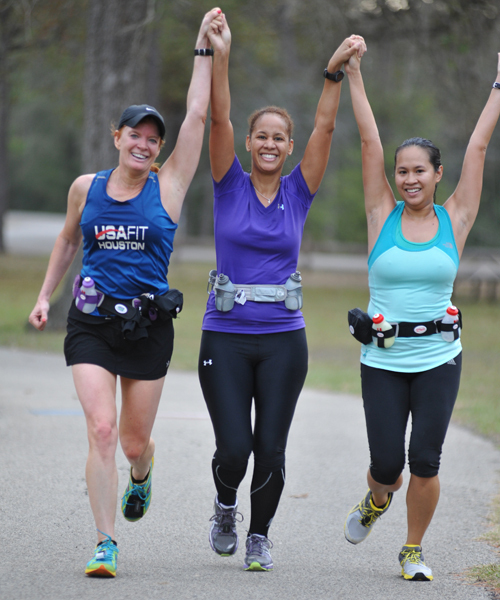 So in 1997, I began training with the coaches and other Houston Fit members and soon discovered that with their support and encourage, I was able to keep adding more miles to my three mile goal Before I knew it, I was running the last longest distance before the Houston Marathon – 21 miles. It was really hard and I started to get discouraged but my coaches kept telling me that I could do it. They believed in me! I ran the Houston Marathon in 1989 on a hot, humid day. The weather made it very challenging and even though I struggled at the end, I finished just in time to get my medal. I decided I would never do another one, that I could check this off my bucket list. However, soon afterwards, it started sinking in just what I had accomplished. I kept thinking, “I just ran 26.2 miles. Me! A mother, wife, employee and basically a couch potato with zero fitness level – trained for 6 months and ran the marathon,” And then began to realize that I not only became healthier but Houston Fit helped me reach a goal that I didn’t think possible. I learned so many things about myself. I learned I was strong. I learned I wouldn’t give up even when it was hard. I learned about commitment and discipline and self-awareness. Running a marathon, with Houston Fit, changed my life. I signed up again that summer and ran the 1999 marathon. It was then that I wanted to give back to the running community that gave so much to me. I volunteered as an assistant coach with Houston Fit, helping the back of the pack runners. Two years later, I became a head coach of that group and then in 2005, I became the Organizer of Houston Fit, overseeing the management of the program. Then in 2007, Denis Calabrese, the founder of USA FIT, offered me the position of National Director, overseeing over 40 training programs across the United States I gladly accepted and then in 2016, was given the title of President of USA FIT. It has been my honor and my privilege to watch hundreds of thousands of runners and walkers across the United States attain goals they never thought possible. To see them form friendships with other USA FIT members who end up becoming like family. I have seen them pay it forward by volunteering to coach or to be a training partner to others in their group, knowing that by helping them change their lives, theirs also will be blessed. I have run 13 marathons and too many half marathons to count. I have hiked the Grand Canyon and Machu Picchu – two adventures I would have never done had it not been for the self-confidence and courage I learned through my marathon training with Houston Fit. I encourage anyone who wants to begin walking or running “just to get fit” or anyone who has a half marathon or a full marathon on their bucket list to consider joining one of the USA FIT training programs. We have 30 years of experience helping people change their lives. We got this! Training and running a marathon mimics life in many ways. You have good running days and bad days. But when you have a bad day, one in which it seems you just can’t put one foot in front of the other, you dig deep inside and you keep going. There are days when you just don’t want to get up a 4 am to meet the group to run a long run, but you do your best to still get out of bed and get to the park. There are times on the marathon course when you hit a rough patch and you want to quit, and that’s when you self-talk yourself into staying on course. “I can do this.” “I’m tired but I’ll walk a little”, never letting negative thoughts take over. And there are times, when you say a little prayer for strength and help. This is what life is about too, hard times happen from time, but we have to have the courage and the strength and the faith to keep going. And once, we do and you’re on the other side, you are a stronger person. Marathoning is not just about preparing your body. You also have to prepare your mind. So, as you know, we’re impressed with USA FIT – tell our readers more, for example what you’re most proud of as a company and what sets you apart from others. USA FIT was started 30 years ago in Houston with just a handful of runners. Today, USA FIT has approximately 40 programs across the United States. In the beginning, the marathon distance was the only race to train for. Since, then the half marathon has come hugely popular. Over the past few years, USA FIT has added a 5K/10K training program for those individuals who want to start exercising but do not want to train for a marathon or half marathon. Our goal is to not only help runners and walkers train for long distance races but to also help new runners and walkers develop a healthier lifestyle by incorporating a running and walking routine into their life. I am most proud of the USA FIT Organizers and Coaches who gives selflessly each season to train each week for six months to help runners and walkers not only get to the start line but to the finish line of their goal races. They make a difference in each member’s lives. There are many marathon/half marathon training programs in the country. I believe USAFIT is unique because we can the person who has not run a step in their lives and six months later finish a marathon. We help the person who wants to improve their health, maybe lose weight, make new friends by offering a less aggressive, shorter distance training schedule. And, we offer advanced training for those elite runners whose goal is to qualify for the Boston Marathon. We have something for everyone. I am a native Houstonian. I have seen our city grow and thrive. I love the parks throughout the city where athletes can run and walk and families can get together for fun and relaxation. There are wonderful outdoor events and races. Houston offers so much to its residents and visitors – the theater, music, the zoo, museums, sports, wonderful restaurants, shopping. So much to experience. If I were to choose one thing I like least about our city, it would be the lack of mass transit. The Metro is great if a person is within the radius it supports but if one is outside that area, it is difficult to get around if a person doesn’t have his own transportation.